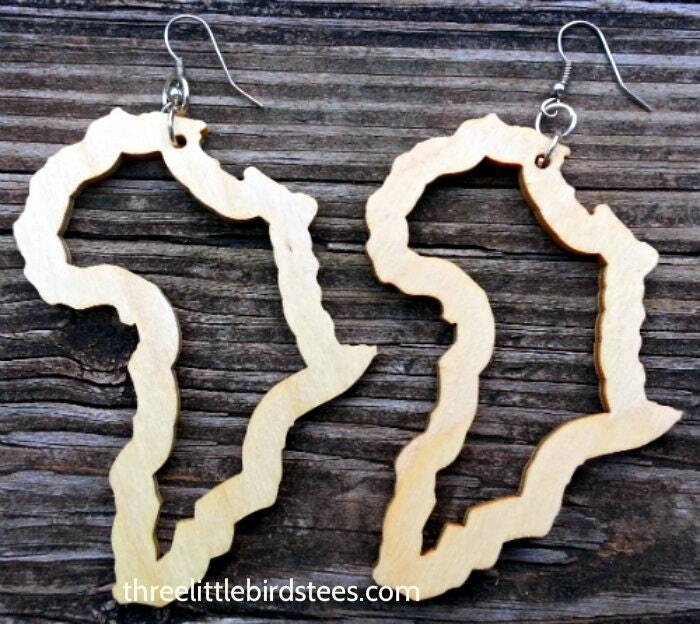 Natural wood earrings in celebration of the motherland. Approximately 3" tall x 2 7/16" wide, light weight. Lightly stained to retain wood's natural finishing. Most orders are shipped out within 1-5 business days from the completion of order. Completion of order includes: payment and sizing information. Please make sure your current address in updated. We will gladly exchange any item If upon receiving your item you find that you need to exchange.Just send me a convo via the etsy convo system and we'll make sure to send details on how to exchange your purchase. Most exchanges are due to sizing misunderstandings. Before choosing your size, please check our size chart to determine what size would work best for you. You may also contact me if you have any questions. Our tees are all baby doll fitted tees and dp run small. Items must be returned in the same condition in which they were shipped and must be received before we can issue any credit. Refunds are given for EXCEPTIONAL reasons only, i.e damaged product, company mistake . Refund requests must be made within 3 days of purchase. Buyer must pay return shipping costs to ship replacement shirt unless a mistake was made by our company.. Please select sizes carefully. Sizing charts are shown in each listing. Thank you for supporting TLBTees. Excellent design. Arrived on time and item looks just like the listing. I highly recommend & will definitely buy again from this shop.